The next morning, Mitsuha awakens as a high school male. Based on information around her, she learns whose body she inhabits. His name is Taki. The two have switched places! When they wake up again, they’ve returned to their former selves. But sleep brings the body swap again and again. Mysteriously, the pattern continues daily. The two fumble about, unaccustomed to each other’s bodies, but start communicating by memo. As they awkwardly overcome one challenge after another, a bond develops between the two- one that evolves into something more romantic. However, there’s something they still don’t know… The unexpected is about to be revealed. The trailer of Kimi no Na Wa aka Your Name anime, had been shared countless time and I’ve been tagged by several friends to watch this film. However, I’m not an anime fan. The last anime I remembered watching was Cardcaptor Sakura and that was… in 1999? So le man (who studied animation back in school) wanted to catch this before he flew off to Japan, and I was (secretly) trying to look for common friends who might be able to watch this with him instead. I mean, the trailer looks interesting, but as someone who prefers non-animated film, I’m not exactly sure if it’s a film I will pay to watch in the cinemas. I didn’t manage to escape, which explain why this virgin anime review exist. So if you are someone in the same situation as I was, and reading this review to see if you should spend 107 minutes of your day, here’s my take (without too much spoilers) and you can decide for yourself. Anyone who had seen (or heard about) Makoto Shinkai would know that this anime director is known for his beautiful visual. To quote le man, “every frame in his film can become a wallpaper”. I had to admit, this is indeed true, especially for the beautiful sky, landscapes and city-scape. The details were as beautiful as it is exquisite. There were many time-lapse sequences and realistic visuals which you can look at over and over again if it’s in gif. He also focused on mood-suggesting close-up shots, be it rain falling, hands working, hair tying etc, a very art-house filming method to let the audience forget that it’s an animation altogether. The characters were likeable. Be it city boy Taki (Ryunosuke Kamiki) or country girl Mitsuha (Mone Kamishiraishi), their contrasting habits, as well as the discovery of themselves in an opposite gender’s body bring smiles to the audience (ie. constantly touching the breasts when he’s in Mitsuha’s body). The director didn’t dwell too much on what they did on a day-to-day basis, which increase the pace and up the humour of the film. I like how the film also introduces several Japanese traditions and practice too. There were the introduction of colour silk braids Kumihimo, the making of kuchikami sake, a pure drink to offer to the gods as well as local traditions and rituals. All these added value to the otherwise more magical adaptation of Korean film “Il Mare” (시월애). Yes, this is a spoiler if you know what the Korean film is about, otherwise, don’t go searching for it. All in all, while I love the fantasy-side and entertaining -side of the film, I was a teeny weeny bit disappointed on how it failed to touch me (to tears?). So have you been pulled along to watch this yet? Your Name anime inspired quite a lot of tourism from the places shown in the anime. The footbridge appearing in the film was near where Makoto Shinkai stayed and he saw many people walking there and taking pictures after the movie’s release.The author was worried by the success as he felt that revenue was not proportional to his own ability. His previous film made 100 times less. 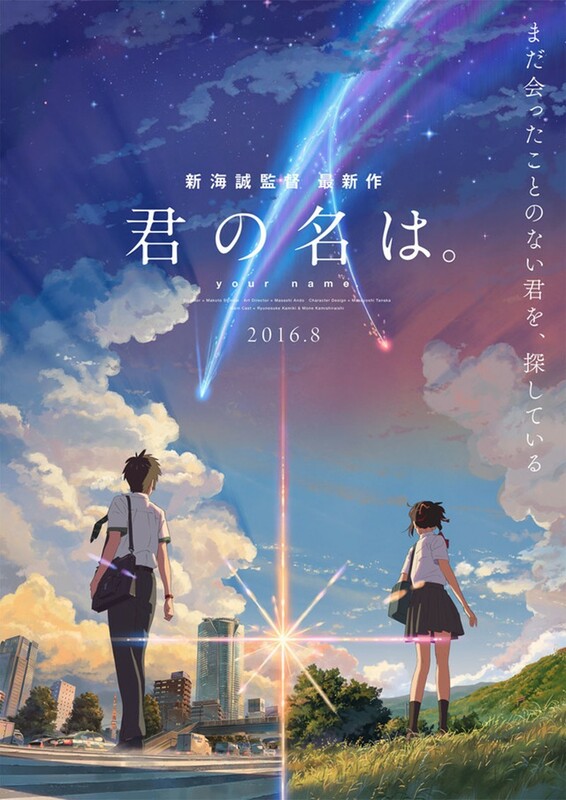 Noda Yojiro, the vocalist of the Japanese rock band Radwimps, composed theme music of Your Name – Zenzenzense (前前前世 “Previous Previous Previous Life”), Supākuru (スパークル “Sparkle”?) and Nandemonaiya (なんでもないや “It’s Nothing”?). Check out Your Name Anime (君の名は) Official Website and Facebook Page! Your Name Anime (君の名は) is out in cinemas on 3 November 2016. I love the story line of this movie and your review is on a higher side. Would surely check this out in theatres. I’ve missed coming to your blog to read up on all the fascinating film reviews you write. My kids are big Anime fans and I’ll share this one with them. Interesting! Since your review gives it good rating looks like I need to watch it. Somehow never heard about it or just missed it. I’d love to watch an anime if it could bring me to tears as well. Maybe it wasn’t too dramatic for you? But for me, as long as it helps me get to know more about Japanese traditions, then it’s enough for me to try seeing an anime movie like this one. It would be nice to see how they deal with the body switching and how they adjust to it. I’m in for a few surprises including romantic ones. The review is nearly perfect. As I read it, though I am not fond of Anime of seeing and monitoring, I might be convinced to see it. But for my 13-year old granddaughter for sure, she will love this. She’s an Anime addict. She even makes use of anime image for her FB profile pix.